Congratulations to Mandy B., Mary P., and Taurus, the winners of Loreth's giveaway. Thank you to all who participated! Thank you Just Romantic Suspense for having me on the blog! I'm here to give away 3 digital copies of my latest single title romantic suspense -- PIECES OF YOU. For a chance to win, please tell us in the comment section why you like to read romantic suspense. And to those who read outside the genre -- who are your favourite authors, and why are they your faves? Because I've had to take a sudden and unexpected trip, I'll be unable to comment myself on Thursday and Friday, but will be in a position to check back in on Saturday Sept 21. Looking forward to reading your thoughts! Sometimes a contract to forget can be as powerful as a promise to remember. PIECES OF YOU is currently available in both print and digital via Amazon.com, Amazon.ca, Amazon.uk and other Amazon sites internationally. 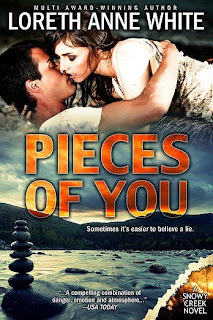 Loreth is giving away 3 digital copies of PIECES OF YOU to 3 lucky commenters telling her why they like romantic suspense. Loreth Anne White was born and raised in southern Africa, but now lives in Whistler, a ski resort in the moody British Columbian Coast Mountain range. It’s a place of vast, wild and often dangerous mountains, larger-than-life characters, epic adventure, and romance — the perfect place to escape reality. It’s no wonder it was here she was inspired to abandon a 16-year career as a reporter, features writer, and editor (under the name Loreth Beswetherick) to escape into a world of romantic fiction filled with dangerous men and adventurous women. 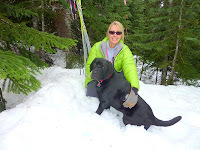 When she’s not writing you will find her long-distance running, biking or skiing on the trails with her Black Dog, and generally trying to avoid the bears – albeit not very successfully. She calls this work, because it’s when the best ideas come. Loreth has won the Romantic Times Reviewer’s choice award, is a double Romantic Times Reviewers’ choice award finalist, a double Rita finalist, a double Daphne Du Maurier finalist, and multiple CataRomance Reviewers’ choice winner. Congratulations Loreth on your recent release! I enjoy romantic suspense because of the fast pace and excitement of the stories. I read romance because I know I will get the HEA. But romantic suspense makes the ride to the end full of hold your breath suspence and hang on to your seats action. The best of both worlds!!! Thanks for the chance to win! Romantic Suspense is one of my go to genre's.. I love that it is gonna have a happy ending, but on the way to the happy ending you get a story full of suspense and intrigue. Wow, I loved the blurb for PIECES OF YOU... It sounds really really good! I enjoy romantic suspenses for their bits of danger... seeing everything come to a HEA at the end. Romantic Suspense is my favorite genre. I love the suspense, intrigue and excitement. The romance makes it even more interesting when the hero and heroine have to work together to solve their problem. Of course, I love a happy ending. I read across all genres, but I know that with Romantic Suspense I can expect a thrilling read. Love the intrigue and HEA that romantic suspense provides. I love the romance in romantic suspense, but I also like the suspense part, usually trying to figure out who did it!! Thanks for the chance to win this one. Sounds really good. I love reading romantic suspense for the suspense, mystery, romance, and that andrendaline high. Best of all, I'm trying to see if I can solve the crime before the hero and heroine do. My first reading loves were all mysteries...Nancy Drew rocked! But then when I discovered romance, it was like, "ooh...I'll check back in you mysteries later!" I think finding romantic suspense satisfies both of those reading preferences. Romantic Suspense combines romance with surprise. Theres nothing better than romantic suspense & your book sounds very, very good.Can hardly wait to devour. All my best to all contestants.